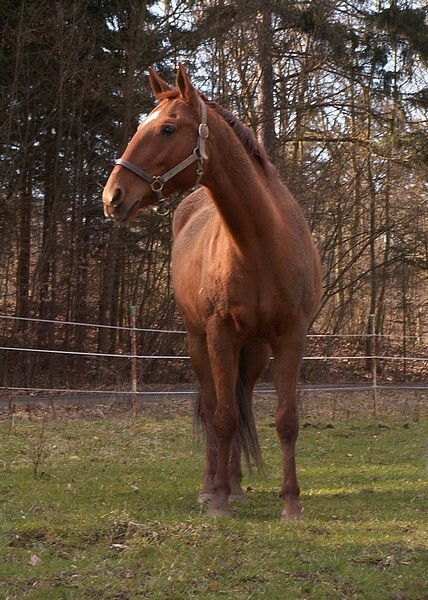 * Sire of the dam is confirmed only according to the original of dam´s pedigree passport, not according to VNIIK. 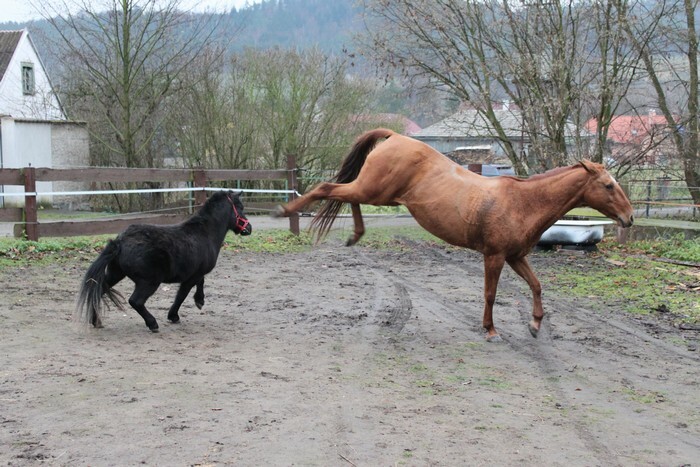 The pedigree is not confirmed by DNA test. 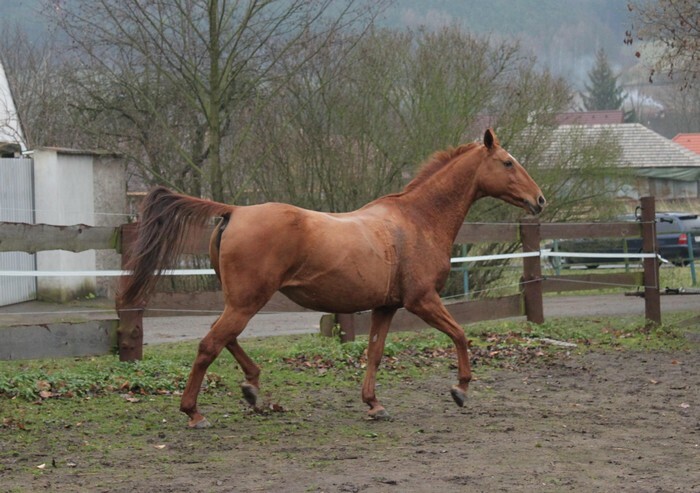 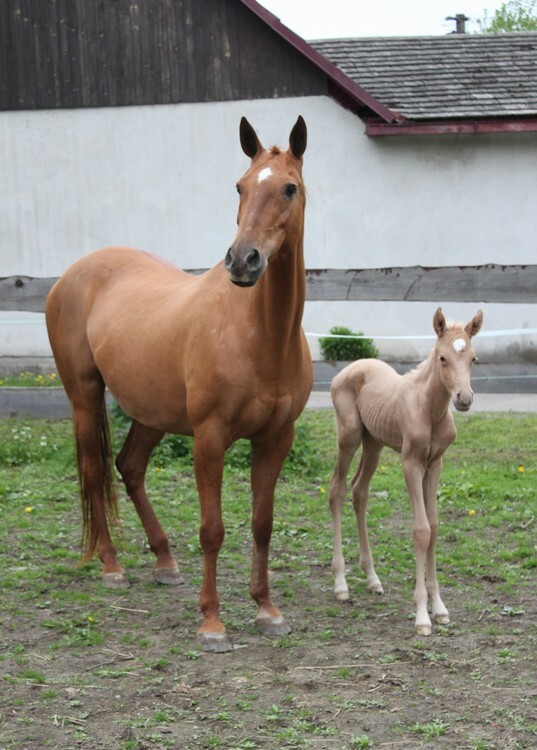 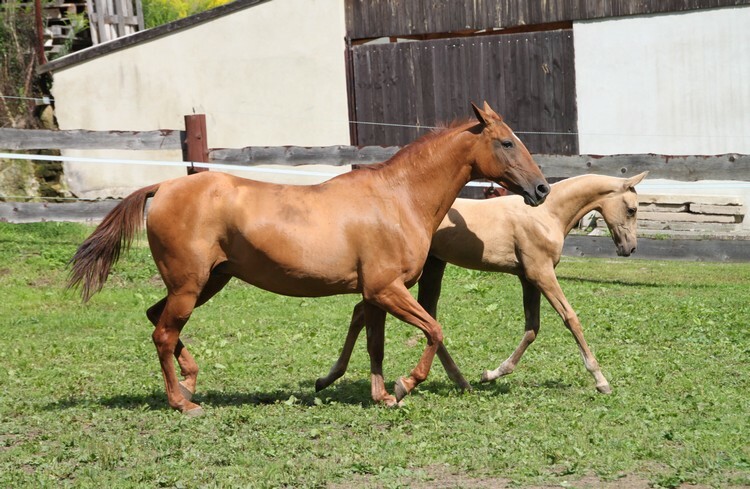 GASPUR is the first Akhal Teke mare, who we have gauner. 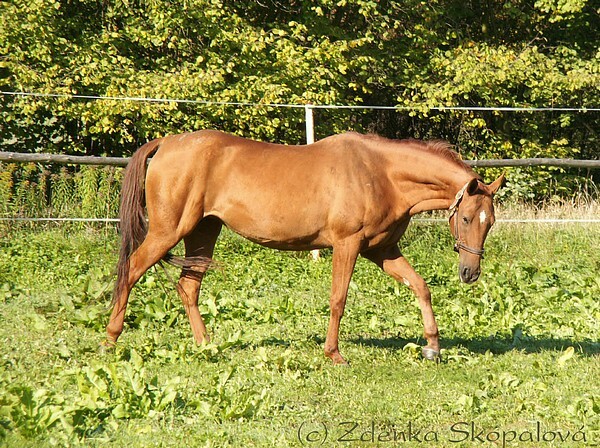 We brought her 12.9.2002 from the breeding of Havlicek husbands from the former farm Achal Teke in Chrastava nearby Liberec. 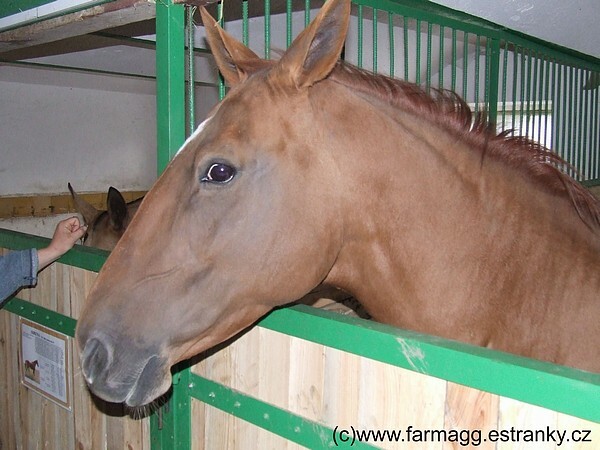 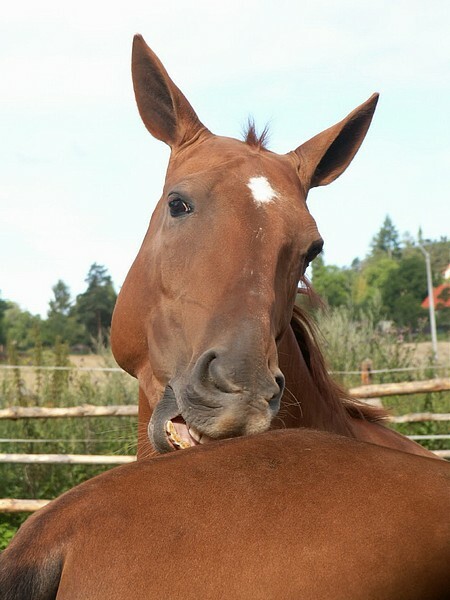 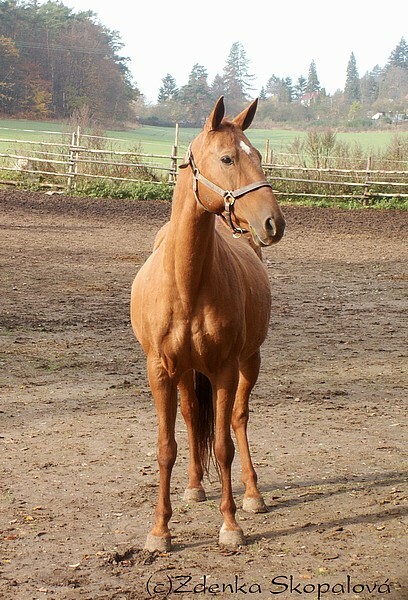 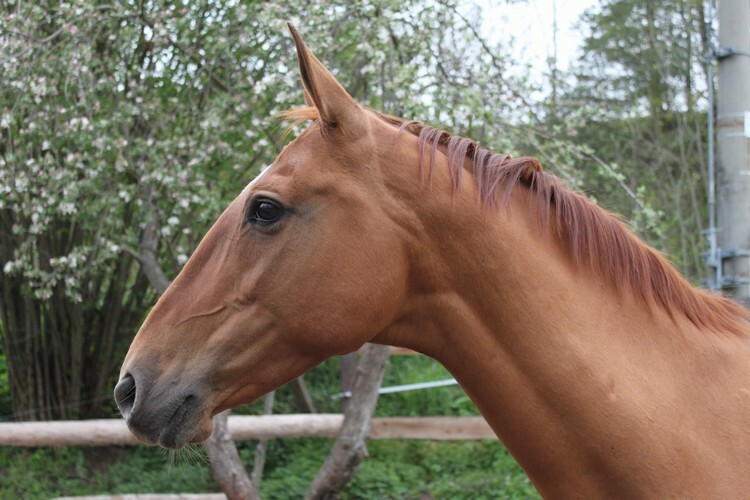 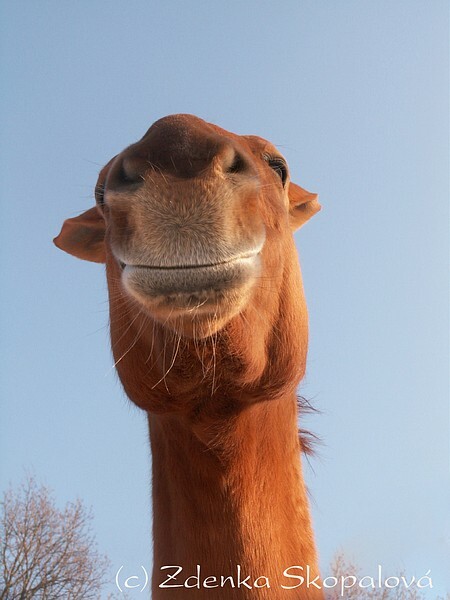 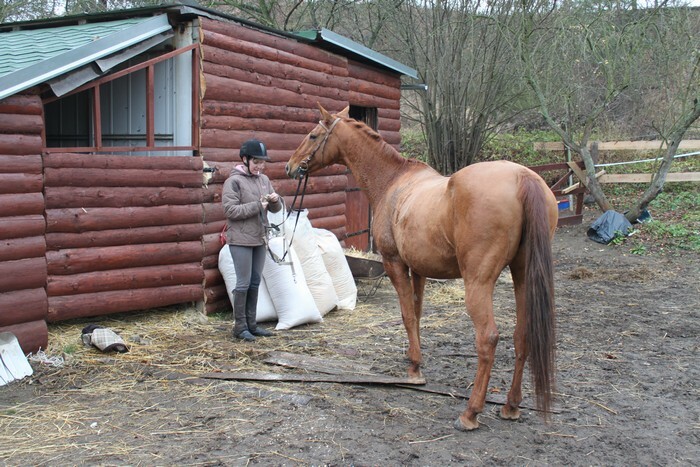 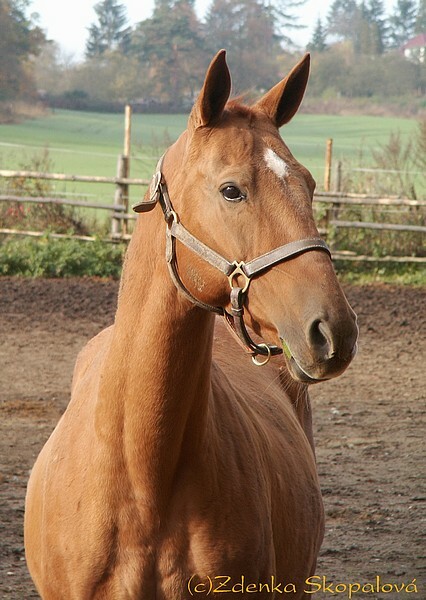 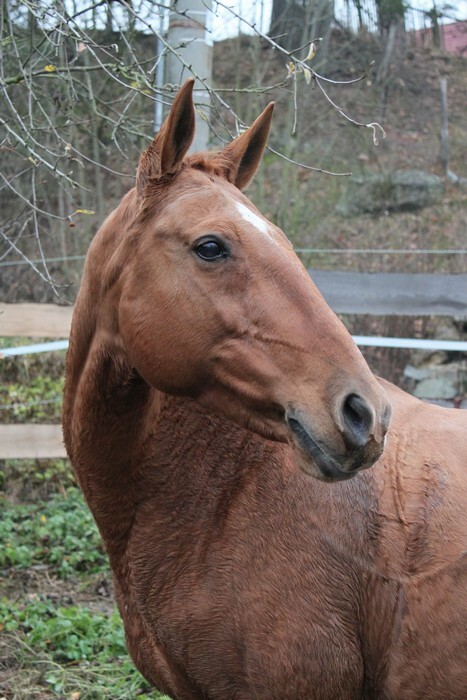 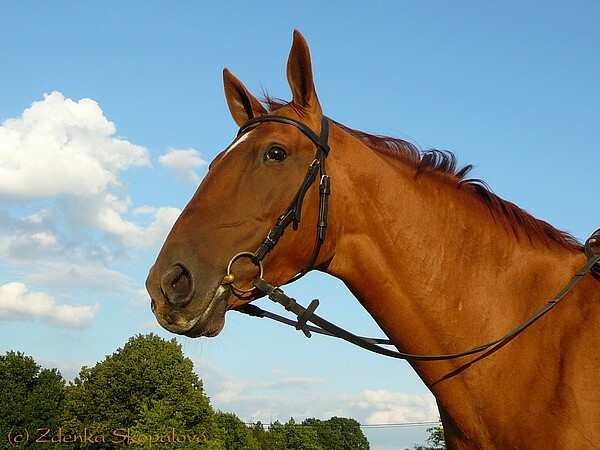 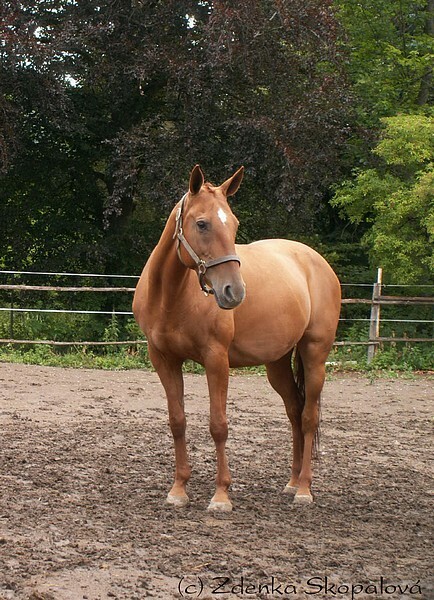 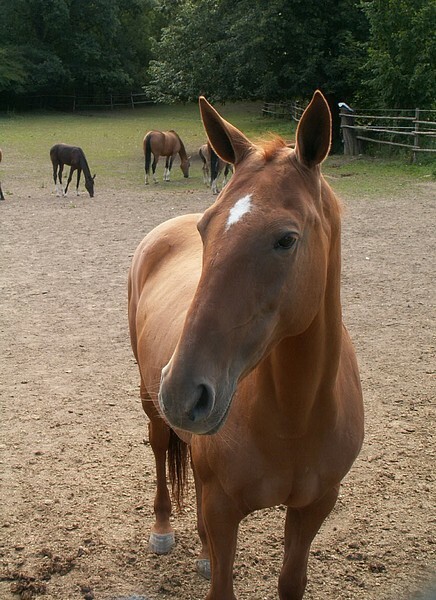 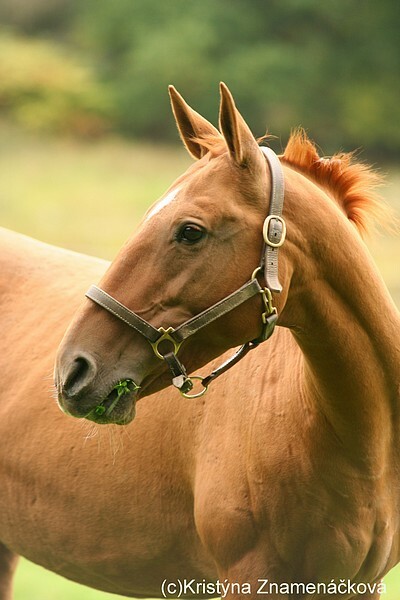 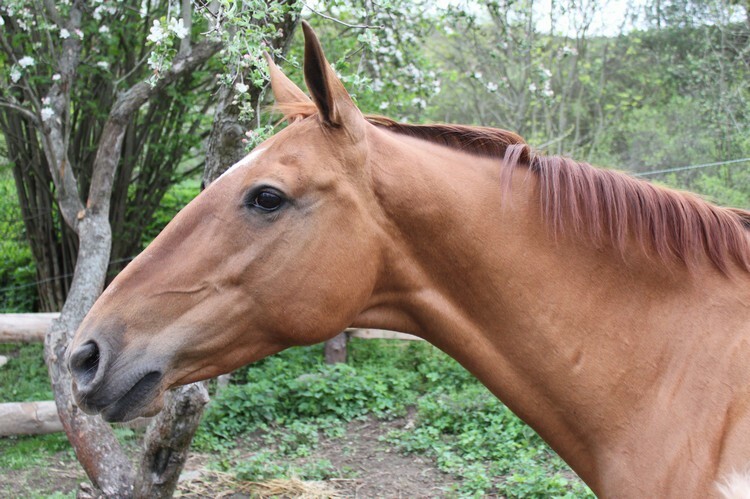 Gaspur is sorrel mare with silky glance, quite wide chest and interesting Roman-nosed head. 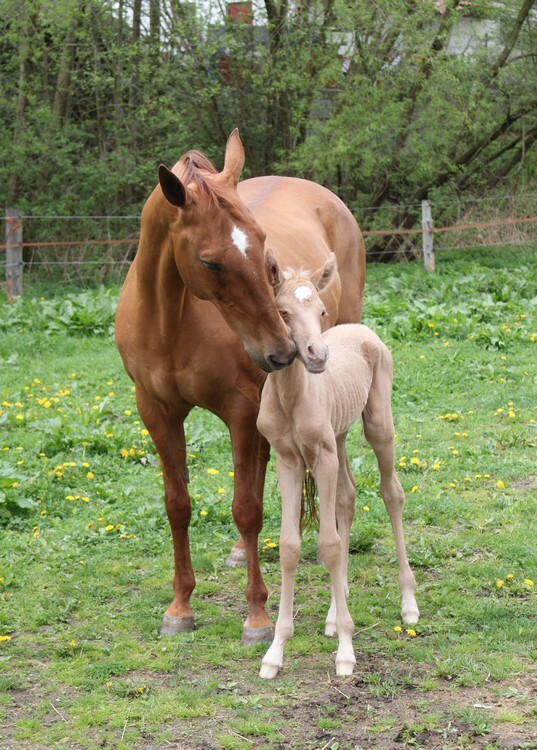 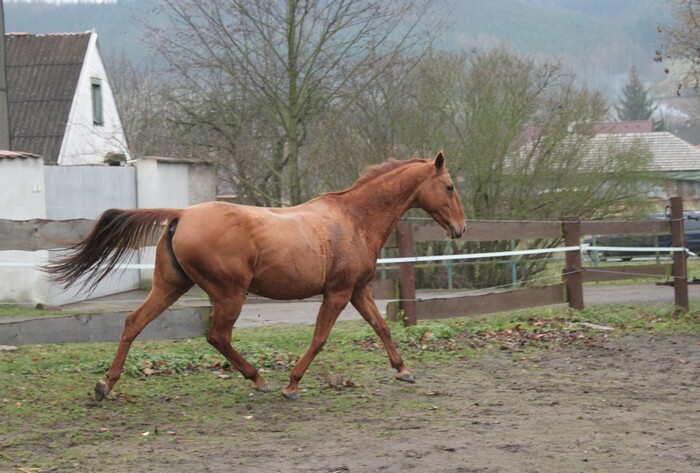 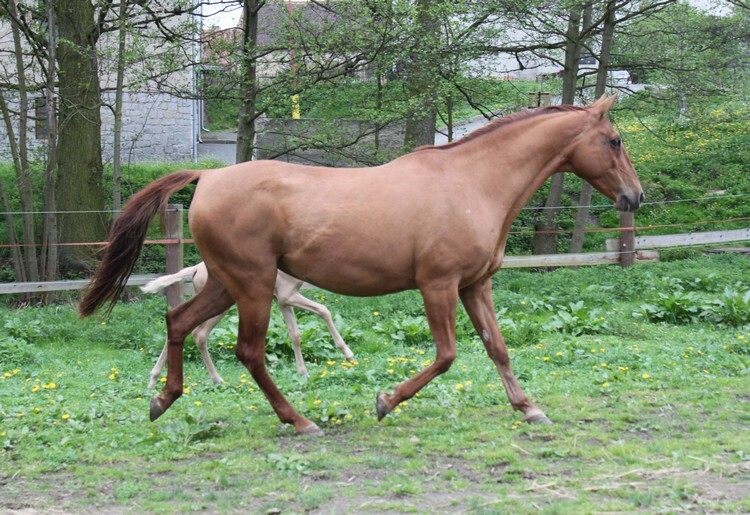 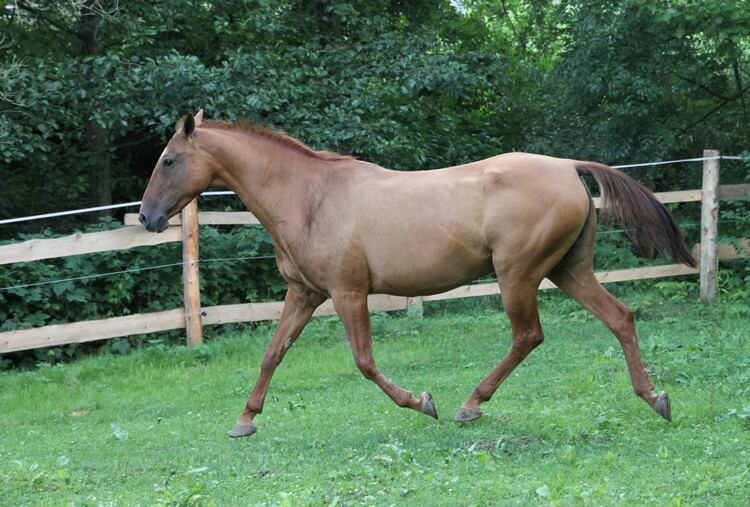 She is strong personality with high inteligence, she is the leading mare of the herd. 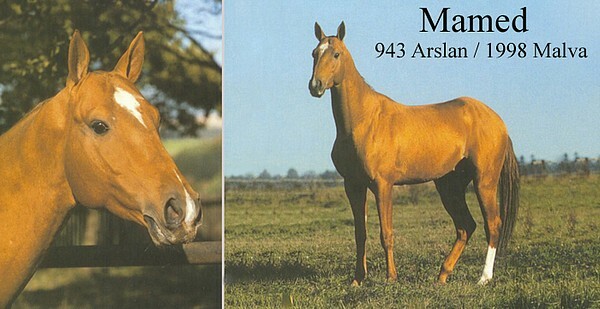 Her sire is stallion Mamed (943 Arslan – 1998 Malva), sorrel, who was born at the studfarm Stavropol. 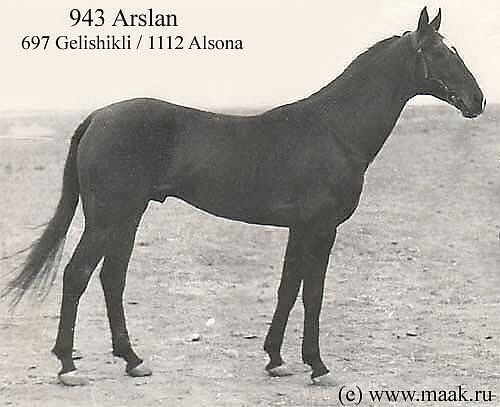 Mamed´s sire, 943 Arslan, is the son of the founder of today´s most widespread line, 697 Gelishikli. 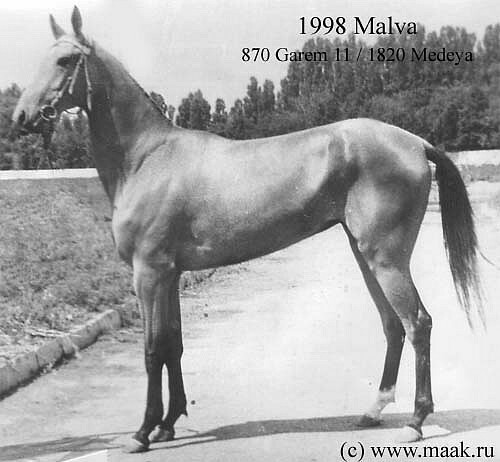 Mamed´s dam, 1998 Malva, is daughter of famous stallion 870 Garem (699 Gundogar-1594 Mantyia). 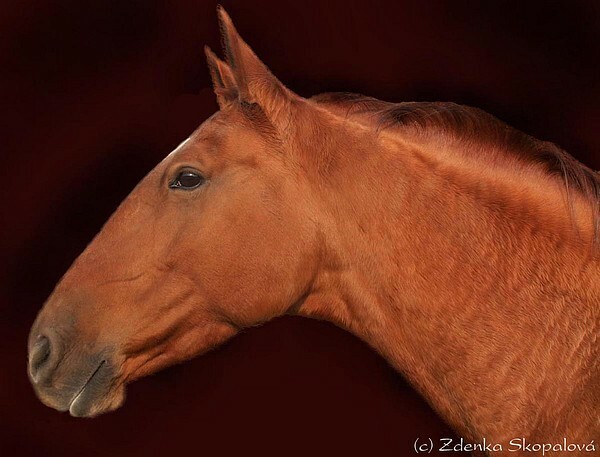 This buckskin stallion was well-known for his „tough“ character, but he was succesful racehorse. 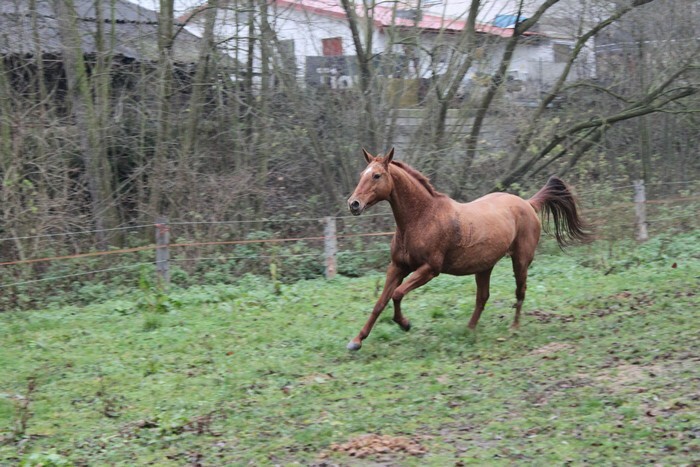 In 10 starts he won once, 5 times finished 2nd and two times 3rd. 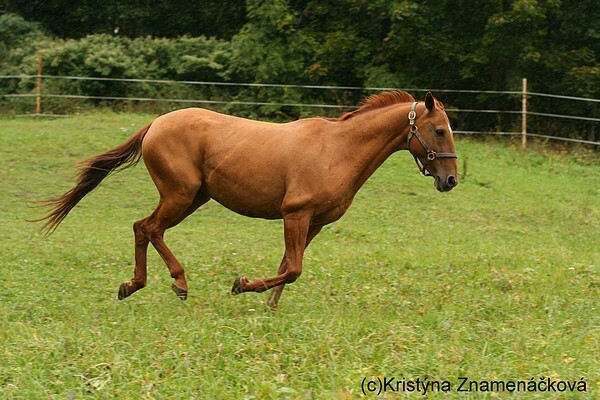 The best results he had on short distance. 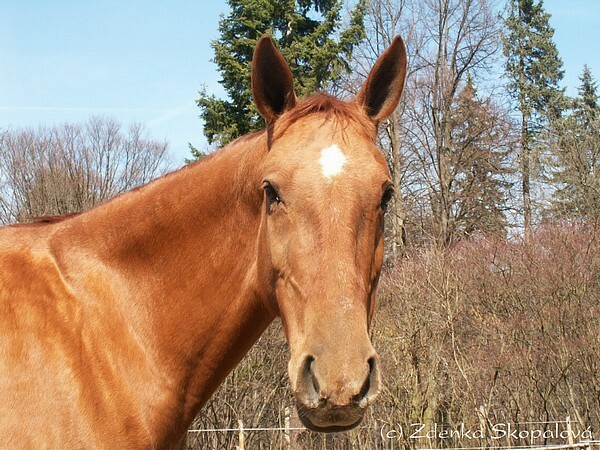 He became outstanding breeding stallion. 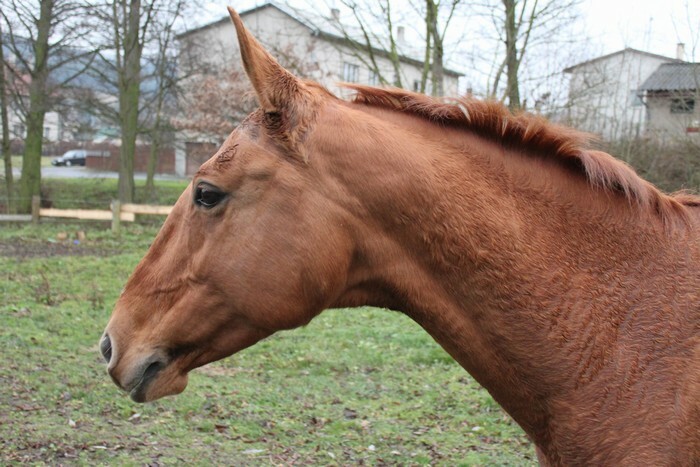 Gaspur is inbred on Garem III x IV. 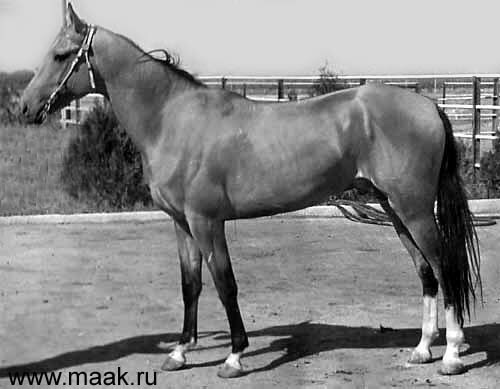 Garem´s son Gaukhar was tall, harmonious and vigorous stallion- Om 1979 he won „Kalinin´s Prize“ and in 1980 he won „Derby“. 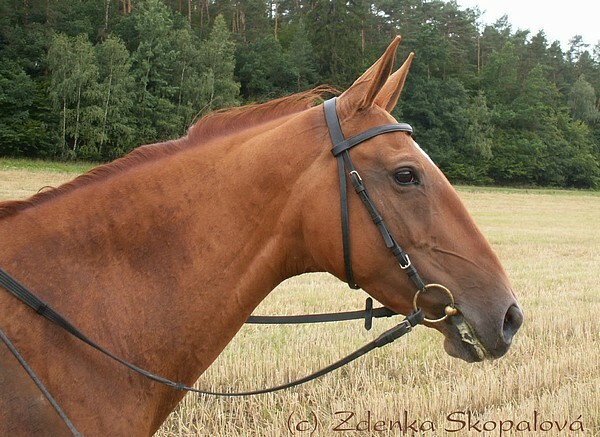 Other succesful racehorse in Gaspur´s pedigree is stallion 858 Ametist, record holder on distance of 2000 m (2:11,5). 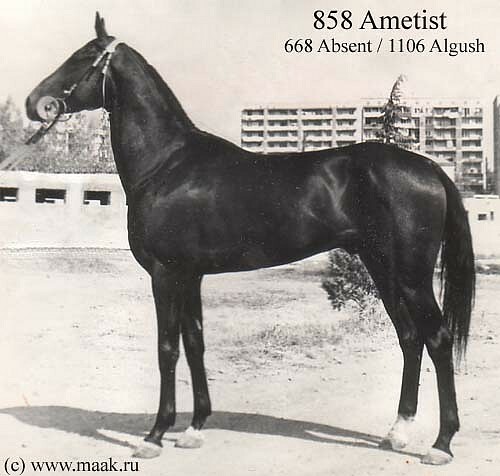 Ametist is son of Olympic dressage winner, stallion 668 Absent, who is descendant of legendary grey stallion 26 Arab. 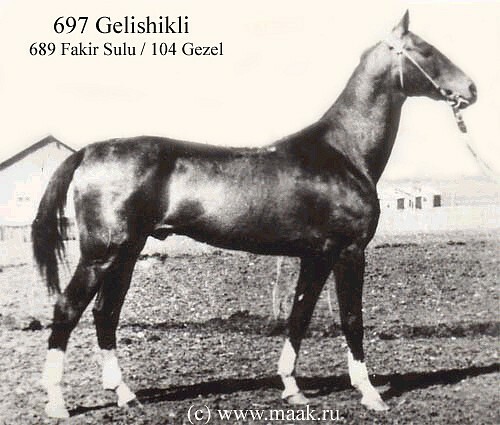 Mamed´s sire and dam belong to Gelishikli line. 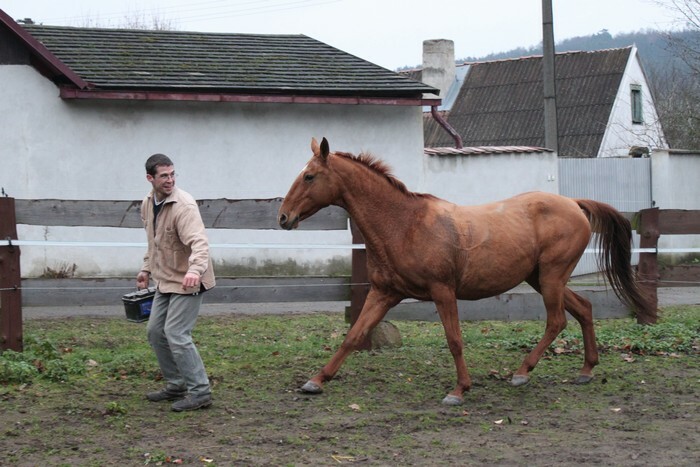 Dam od Gaspur is mare Gayka, who came to Czech Republic in utero from the covering of mare Gazli 9 at the studfarm Lugovskoi. 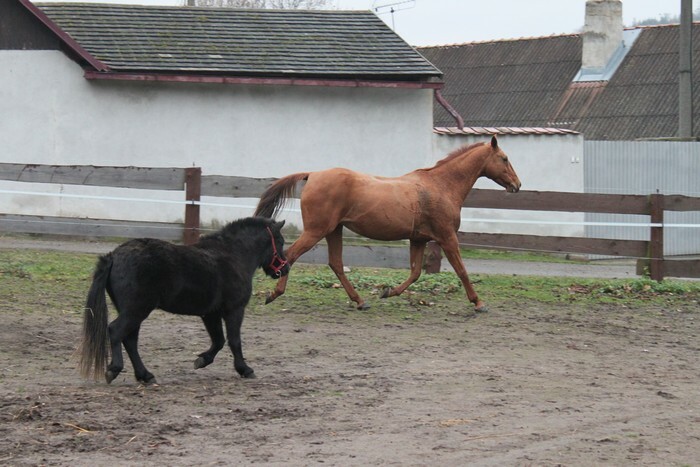 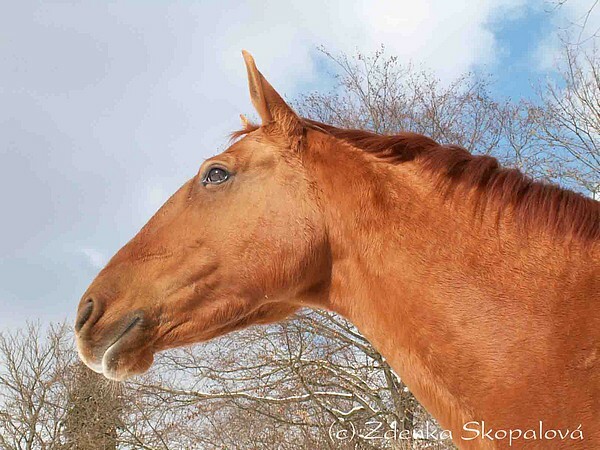 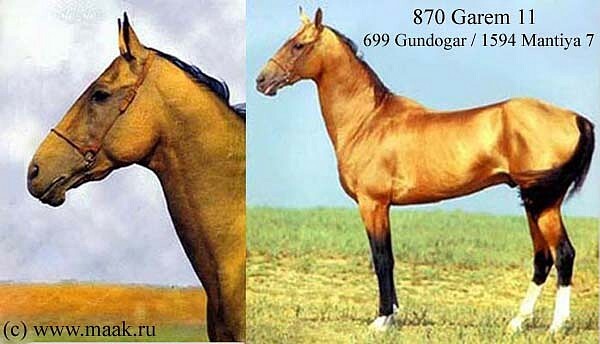 According the pedigree, Gayka´s sire is stallion 1045 Gektor, unfortunately the origin is not confirmed by DNA test. 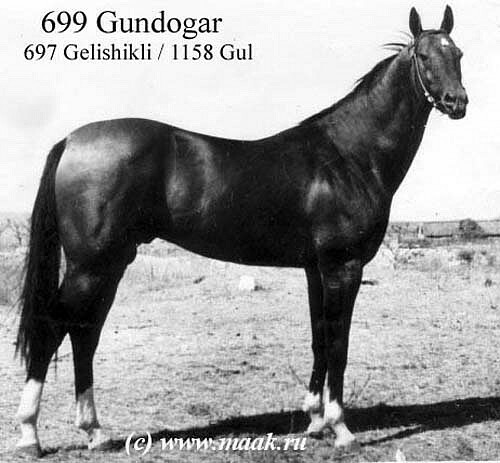 Stallion 1045 Gektor is the son of buckskin stallion 944 Gaukhar through whom we get to 870 Garem and once more to Gelishikli line. 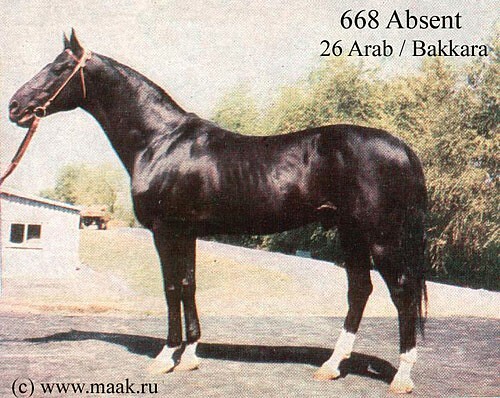 Gaspur´s grandmother, mare Gazli, is from her dam´s side granddaughter of 668 Absent. 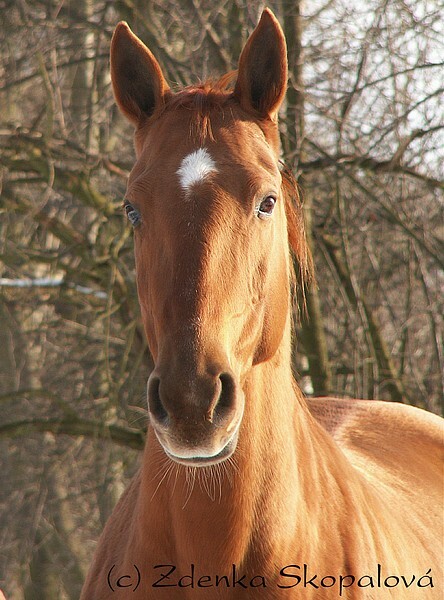 So Gaspur is inbred on this Olympic dressage winner IV x V.